In this building, kadoaties can be fed for a trophy and avatar. Kadoaties, or Kads for short, are cat-like petpets that wail loudly if they are hungry, upset in any way, or if the lights are out. As TNT says, they are a pain in the neck. 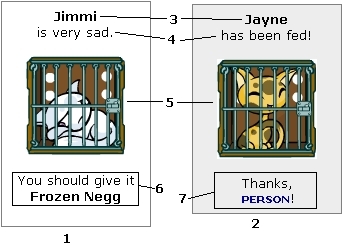 While Kadoaties are real petpets on Neoepts, the Kadoatery does not give them out. To feed Kads, you will need to use the Kadoatery times board (found in the Games Chat). It will help to be familiar with the terminology when reading the board. RS: Restock. When the kads ask for more food. RF: Refresh at the Kadoatery. Main: The time when the majority of the kads RS. Mini: The time when a minority of kads RS, usually caused when someone feeds a UB. Pend: When the kads do not RS at the possible time and so the next possible time for a RS is listed. Overfeeding/Overfeeder: The act of feeding/A person who feeds more than the necessary 75 Kads to go Pink. Pink: A term used to describe a person with 75+ Kad feeds, earning them the pink Kadoatery - Mew! avatar. 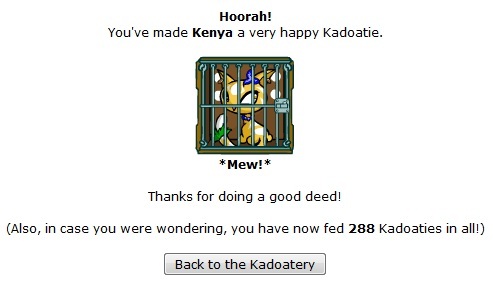 Mewbie: A person new to Kad feeding, usually referring to people with 10 or less feeds. UB: UnBuyable. A kad food worth 100k or more. HN: Had Nothing. Said when the Kads did not ask for an item that feeder has. CF: Congrats Feeders. Quick way to say congratulations to anyone who fed during a Main. Pwned: When someone is beaten to a kad feeding by another user. Inventory: The type of food a person keeps in their inventory to feed Kads. At the Kadoatery, there are two possible states for the kads to be in: fed or unfed. When you have the item the kad is asking for, click on the picture of the unfed Kad to feed it. You cannot feed a kad that has been fed by someone else. Kad names are generated randomly from a set. They vary from staff names (Snarkie, Viola, Adam, Donna, TPOSG), popular fictional characters (Sasuke, Draco, Kif, Percy), Neopets characters (Sophie), random normal or just plain odd names (Muffy, Daisy, Taffy, Thomas, Jimmi, Kittybums), and random funny names (Megabyte, Inara, Binary, 01101011, 1337). 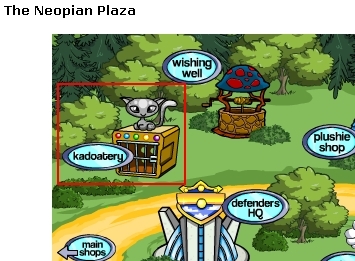 None of the kads in the Kadoatery are owned or named by Neopets users. At first glance, feeding doesn't seem difficult. Find out what the Kad wants, get the item, click the Kad to feed it. While those are the basics, feeding is not that easy. Users race to feed a kad first and it is very common to be beaten to feeding the Kad. Slow computers make feeding much more difficult. New Main @ :TIME: This is a reminder for main. Kads do not go at a new main. Instead, they will pend. Main Pending RF @ :TIME: When the time says pending, there is a possibility the Kads will ask for new food at that time. Refresh at the kadoatery up to 90 seconds after the minute listed. If the Kads do not ask for new food, then main will pend again in 7-minute intervals. Mini (Number of Kads) @ :TIME: If there is a mini, it will be listed separately from main. The number in parentheses is the number of Kads in the mini. If no number of kads is listed, assume it is only one kad. If there is more than one mini, they will be numbered separately. If there are unfed kads, move quick! A successful feed will result in a congratulations page with an updated number of feeds. If someone else is faster, the page will list the name of the successful feeder instead. Usually there is not time to attempt to feed a different kad in the same main after a failed attempt. A user may only feed one kad per main. While there are technically four methods, only three are practical. Many people will use combinations of two of the three basic methods of feeding, and some even use all three! In inventory feeding, the idea is to keep possible foods on-hand in case the kads ask for one (max of 50 items in an inventory). It is best to have all items in the chosen category if possible. This set will be referred to as an inventory. Foods can be split up by the shop they sell at or a word in their name. "Hot dog", "soup", or faerie foods are popular possibilities. If considering a large inventory, keep in mind that TNT has stated it is suspicious over long periods of time to hold more than 50 items on-hand. During a RS, use Ctrl + F to find a food with a certain term in it (e.g. "cake"). Cons: Number of feeding attempts is limited by whether or not the kads ask for those specific foods. Requires an upfront investment in food to keep on-hand. SDB feeding is an expanded version of inventory feeding. Two internet windows are required: Kadoatery and SDB. When the Kads RS, copy a food name quickly, switch tabs, and search for the item in your SDB. If that item is in your SDB, get it out, switch back to the Kadoatery, and click the Kad to feed it. The more food items in an SDB, the more effective SDB feeding is. It's best not to have a PIN on your SDB for this type of feeding as it will slow you down. Pros:More options than invent feeding. Slightly faster than SW feeding. Cons: Slower than invent feeders. Most expensive of the three basic methods. Shop Wiz (SW) feeding requires two internet windows: Kadoatery and Shop Wizard (with Search Items set to identical to my phrase and a fair amount of NP on hand). When the Kads RS, pick one of the items, copy and paste it (using Ctrl+C and Ctrl+V) into the SW Search box and search. Click the first user that comes up, buy the item, switch back to the Kadoatery and click the unfed Kad. If another player gets to the Kad first, some feeders make a profit kadding by selling the foods from those failed attempts at a higher price. Pros: Doesn't matter what the kads ask for. Cons: The slowest of the three basic methods without practice. Requires a fast computer. UB feeding is where feeders will see what UB foods kads are asking for, buy the expensive foods and feed them at any time. Feeding a UB at a time other than main will cause a mini. Pros: Almost a guaranteed feed. Cons: Nearly impossible to obtain the avatar because of the price. Highly impractical. Successful feeders are rewarded a trophy based on how many kads they have fed. If a feeder reaches 75, they are awarded an avatar. The Food Lists here are updated regularly, and are useful for picking inventories or buying for SDBs. Location of the Kad boards. Kad feeding can be a fun and competitive game. With enough perseverance, anyone can go Pink! The Snowager is awake. He'll be sleeping in 4 hours, 5 minutes.